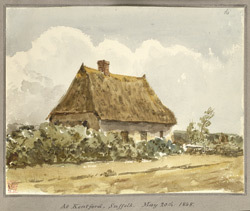 View of a thatched cottage at Kentford, a village on the Suffolk/ Cambridgeshire border. It actually lies along the highway between Newmarket and Bury St Edmunds. It is transversed by the River Kennett and its name probably meant 'ford over the River Kennett'. The parish had originally consisted of arable land, heath and pasture but in 1827 almost all the land was enclosed.